A pack that integrates the suit symbols neatly into the whole image. In this early Transformation Pack by H.F. Müller of Vienna, whose name can be seen on the 3 of Clubs and King of Diamonds, the court cards are anonymous, perhaps characters of the stage in theatrical costumes. The forty numeral cards contain a collection of delightful period scenes of everyday folks in imaginary stage sets depicted with a subtle sense of humour and excellent characterisation of figures and faces. 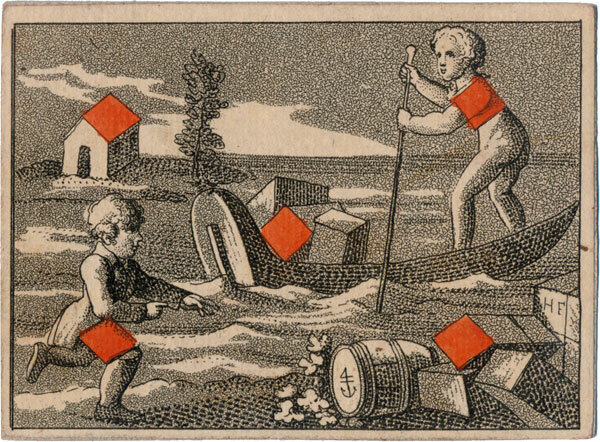 The maker's initials and trade mark are visible in the 5 of Diamonds (right). H.F. Müller of Vienna also published the "Beatrice" transformation pack, 9 years later in about 1818. Above: Transformation Pack by H.F. Muller of Vienna, 1809. From the collection of Barney Townshend.